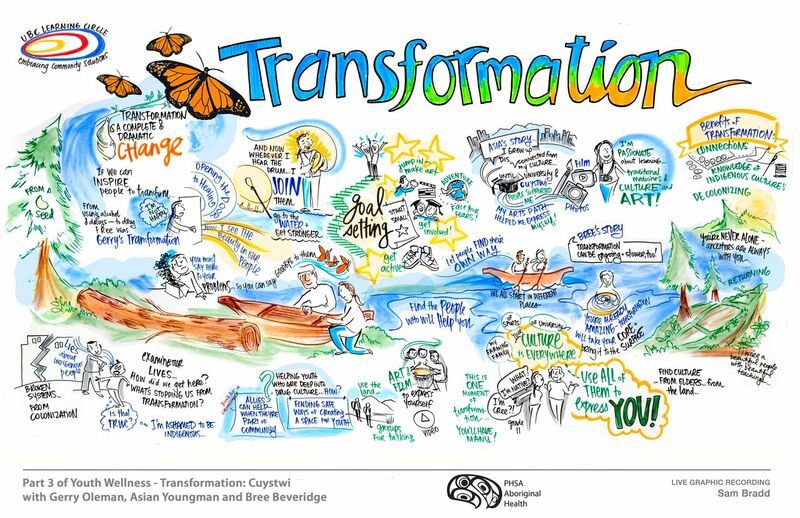 As a graphic facilitator, it’s an honour to partner with the Indigenous Youth Wellness Learning Circle with Elder Gerry Oleman and Asia Youngman from Cuystwi! I always feel that working with Cuystwi is transformational. I thought I’d share a little behind the scenes about this image to help share why. I’m a non-Indigenous graphic recorder who works cross-culturally. People often ask me how graphic facilitators decide what to draw. It starts from a place of listening. That’s important for non-Indigenous practitioners when working with Indigenous communities. Listening helps me be self-reflective, and center other peoples’ experiences instead of making assumptions. This helps me create a graphic recording from a place of cultural safety and with cultural humility. Cultural safety and humility starts with listening, before I begin drawing. Before the session, I got to listen to Gerry and Asia talk about what they’d share in the Learning Circle. They decided to focus on journeys of re-indigenizing, decolonizing health and wellness, connecting to culture, finding Indigenous heroes, and finding your gifts. This conversation helped me understand how communities want to see themselves represented in my graphic recordings. This is important to my work: I want to be ready to draw. I want to have visual fluency when topics are joyful and also if they’re painful. So when speakers talk about upsetting realities, such as the impacts of racism on health and wellness, I’m ready with a deeper understanding of how colonialism is always present. This helps me draw what is broken. At the same time, I want to be ready to draw Transformation to capture the hope, and stories of resilience in a graphic recording. As a graphic facilitator, I’m also trained to listen for metaphors. Our conversation ahead of the session also gave me an opportunity to ask about potential metaphors to show “Transformation”. Metaphors aren’t always needed or appropriate for graphic recording – every session is different. But when they fit they can be powerful. And this was a short session: just 90 minutes, so a metaphor could help me organize the page quickly. Gerry advised that a journey was important for Transformation, so we chose a tree. If you look closely, the tree is Transformed in 4 places in the image. The tree begins on the left, then it is chosen to become a canoe. The canoe is placed into the water – because “we all start in different places” in the area where Asia and Bree Beveridge tell their stories. Then finally, the canoe returns to the forest and becomes part of the soil again. The tree transformation becomes a way to read the picture – and show the positive, resilient individual transformations that Gerry, Asia and Bree are talking about! The UBC Learning Circle format means the session was live broadcast and also recorded, and resources are below.